This app is intended for entertainment purposes only and does not provide true voice evaluation functionality. Ever wonder how your voice stacks up against famous performers like Britney Spears, Christina Aguilera, Miley Cyrus, Madonna, Rhianna, Carrie Underwood, Mariah Carey, Kelly Clarkson, Justin Bieber, Avril Lavigne, Katy Perry, the cast of Glee, Fergie, Jennifer Lopez, Mary J. Blige, Lady Gaga, Miranda Lambert and Martina McBride? 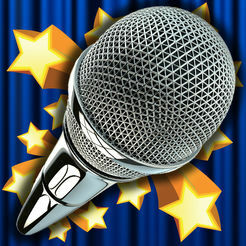 Find out now with Idol Judge – singing and voice talent evaluator! Depress the ‘Evaluate Voice’ button and point the iPhone’s mic in the direction of the performer or yourself. Keeping the ‘Evaluate Voice’ button depressed, Watch the live VoiceWave™ technology react while you sing. 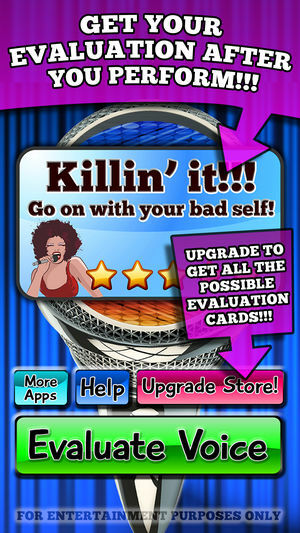 Finally, release the ‘Evaluate Voice’ button and receive an evaluation card when you finish. Idol Judge will analyze and evaluate the audio data to let you know how good (or bad) you are. 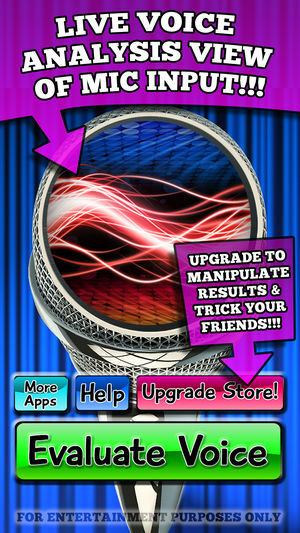 For a little fun with your friends or an ego boost you can upgrade to unlock the ability to manipulate results. Then you can decide how good or bad the performance is and the app will show an appropriate result card.